The exquisite small sketch of a tondo on the recto of the Metropolitan sheet was undoubtedly intended for a medal on a theatrical costume, therefore perhaps related in theme to the verso sketches for the staging of Baldassare Taccone’s La Danae or another festa. In its type of design and drawing style, the recto drawing on the Metropolitan sheet is closely comparable to two other sheets with small allegorical scenes inscribed within a tondo shape, one in Cambridge (Fitzwilliam Museum inv. PD.120-1961) and the other in Bayonne (Musée Bonnat inv. 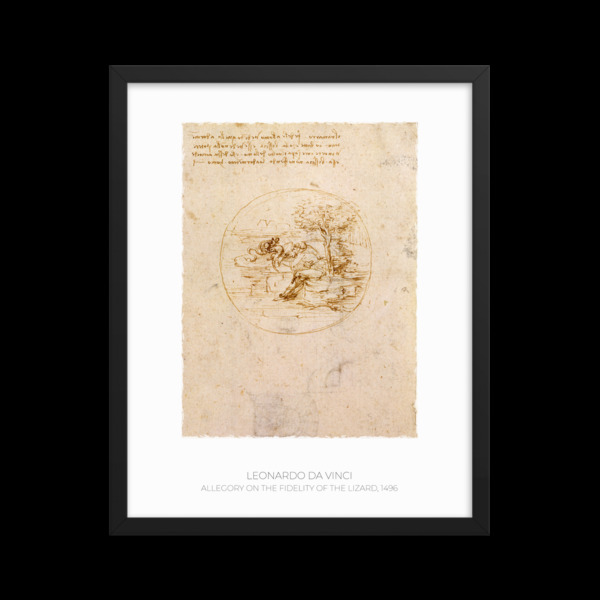 656); all three sheets are rendered with the same style of quick, reinforced outlines and delicate parallel-hatching typical of Leonardo’s drawings of the early to mid-1490s, and can be placed close enough to ca. 1496, as a terminus ante quem, based on the verso of the Metropolitan sheet with the Danae sketches. As Leonardo explained at the top in the accompanying inscription on the recto of the Metropolitan sheet, the sketch portrays a man sleeping by a tree, while to his right, a green lizard, or “ramarro,” loyally attempts to overcome a grass snake (“biscia”) that threatens him: ““il ramarro . fedele allomo vede[n]do quello adorme[n]/tato . co[n] batte . cholla bisscia esse vede no[n]lla potere / vincere core sopra il uolto dello mo . ello dessta accioche / essa . bisscia no no ffenda loadorme[n]tato . homo.” The specific fable of the lizard and the sleeping man (though no other allusions to it exist in Leonardo’s notes) may be interpreted as an allegory on the virtue of fidelity, which is often defined by the attendant qualities of alertness and protectiveness. Cranes are described by Leonardo (Paris MS H, fol. 9r = H1, fol. 9r), as analogous examples of “fedeltà over lialtà,” an idea he closely reprised from an edition of the popular, printed Fior di virtù. Such visual imagery of animal fables and allegorical compositions inspired Leonardo’s work during the very late 1480s and 1490s, in reading Aesop’s fables, Medieval bestiaries, and Pliny the Elder’s Naturalis historia, together with two very popular books of his day, Cecco d’Ascoli’s L’Acerba and the anonymous Fior di virtù, editions of which were printed in Venice in 1471, 1474, 1477, 1488, 1491, and later. Leonardo himself had owned exemplars of these books by the mid-1490s (see inventories in Codex Atlanticus, fol. 559r, of ca. 1493-95; and Codex Madrid II (inv. 8936, fol. 3r-2v), of ca. 1503-5: “plinjo,” “fiore de uirtu,” and “ciecho dasscholj”). He also copied passages from Pliny, Cecco d’Ascoli, and the anonymous Fior di virtù, sometimes almost verbatim, into the Paris MS H1 (fols. 5r-27v), of ca. 1493-94 (cfr. Marinoni 1986-90, MS H; Pietro C. Marani in Marinoni 1986, p. 141). The verso of the Metropolitan Museum sheet depicts sketches and notes intended for the staging of the musical comedy in rhyme, La Danae, on 31 January 1496. This comedy in five acts was written by Baldassare Taccone, chancellor to “Il Moro” and an amateur playwright himself; La Danae was performed at the house of Giovan Francesco Sanseverino, the count of Caiazzo and elder brother of Galeazzo. Based on Ovid’s Metamorphoses (Book 4:611), the story line of the play follows the travails of Danae, daughter of Acrisius, king of Argos, seduced by Jupiter disguised in the form of a shower of gold, and eventually transformed into a star, hoisted into heaven. Taccone’s text establishes the precise date of Leonardo’s sheet, although the drawing on the recto may possibly be somewhat earlier, to judge from its affinity of subject matter with the bestiary notes of the Paris MS H, which firmly dates to ca. 1493-94. The verso of the Metropolitan sheet depicts a quick, working sketch of the actual design for the staging of the piece, drawn “con brevi segni,” as counseled in Leonardo’s note (Paris MS A, inv. 2185, fol. 27v), of ca. 1490-92. At upper left, a list of names, including that of Danae, identifies the actors for the roles in the performance. As is usual for Leonardo, the sense of his notes is from right to left, so that the numbers and fractions indicating measurements for the positioning of each actor on stage precedes his name; it is possible that the Danae was staged on a moving platform, operated by machinery, which would have required a precise placement of the actors. The sketches render the stage design in an elevation, a plan, and a “bird’s eye view.” According to Leonardo's note on the verso of the Metropolitan sheet, Acrisius, king of Argos and the father of Danae, was to be played by Gian Cristofano, the gardener Sirus by Baldassare Taccone, while Danae, the headstrong princess and main character, was to be acted by a young man (not unusual for the time), Francesco Romano. The god Mercury, who was to descend from Olympus hoisted from a rope and pulley, was to be played by Gian Battista da Osimo. The lecherous god Jupiter, who transformed himself into a shower of gold to impregnate Danae, was to be portrayed by Gian Francesco Tanzio. The piece also included roles for a servant and for at least one “heavenly messenger” (“annuntiatore”). In the elevation sketch at left, the enthroned figure surrounded by an aureole of flames is Jupiter, the seducer of Danae.